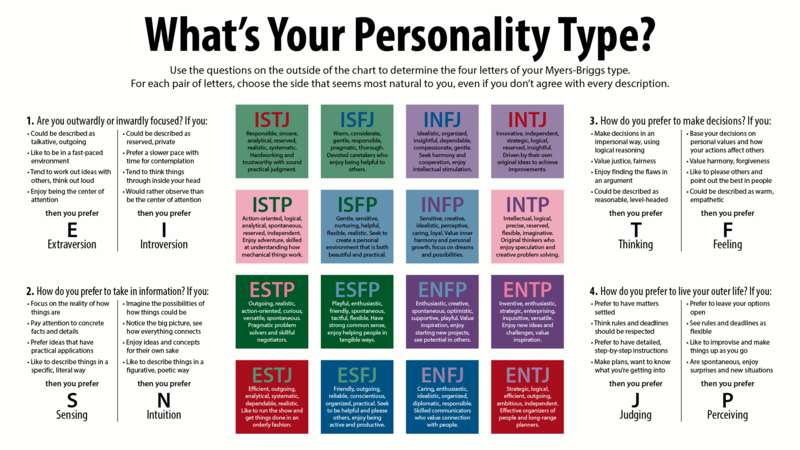 Back in 1945, Katharine Cook Briggs and her daughter Isabel Briggs Myers pioneered the Myers-Briggs Type Indicator (MBTI) personality test, which sorts people into four different types of psychological classifications, based on the research of Dr. Carl Jung in the 1920’s. The most used personality test, it categorizes a person as either: (i) an Extrovert or an Introvert; (ii) Sensing or Intuitive; (iii) a Thinker or a Feeler; and (iv) Judging or Perceiving. You can learn more about the specific definitions for each of these classifiers from this infographic. If you are curious about your personality type, or want to test your employees, there are several free online personality tests you can take. I once took this test. My four-letter classification came back as ENTJ. According to the Myers Briggs website, that would describe me as: “Frank, decisive, assume leadership readily. Quickly see illogical and inefficient procedures and policies, develop and implement comprehensive systems to solve organizational problems. Enjoy long-term planning and goal setting. Usually well informed, well read, enjoy expanding their knowledge and passing it on to others. Forceful in presenting their ideas.” I would say that is a fair summary. The problem is, if I read any of the other 15 classifications on that page, there are elements of each of them that also apply to me. Trying to label employees in pre-defined buckets is a nice goal, but it isn’t really all that practical, as people behave differently in different scenarios and can live across categories. For example, a good manager knows when to manage with an “iron fist” or “kid gloves,” depending on the situation and employee. Several years ago, based on my personality test results, a large company that was hiring said my entrepreneurial skills were “off the charts” compared to their current employees (e.g., which they perceived as overly willing to take risks). I didn’t get the job, despite a great personality fit with the team and a perfect skillset for the job. I couldn’t believe this company was actually making hiring decisions based on personality type, as opposed to who had the best skills to get the job done and help the company hit its goals. And, in this specific case, it explains why this same company is now teetering on the brink of bankruptcy: they were not hiring any innovative “out of the box” thinkers that could help pivot them into new directions to evolve with the times. I have never used personality tests in any of my hiring decisions. To me, as a good CEO, I have my finger on the pulse on the desired culture and needs of the organization. It is materially more important to hire a person that has the best skillsets for the job, so they can come out of the gate running and help us achieve our business goals, than it is to have a specific personality type. And, that strategy has served me well over the years, building several successful companies with great teams along the way. 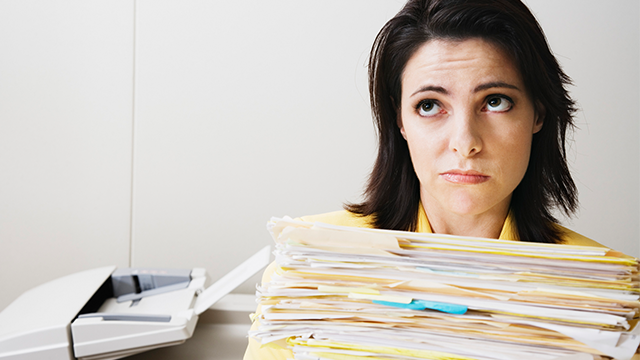 So, don’t overthink the need for personality tests. To me, they are a nice-to-have, not a need-to-have. There are many resources for how best to build your startup team and how to build a good business culture that do not rely on such tests. What are personality tests good for? Most hiring managers think personality tests are a good predictor of a candidate’s future job performance or fit within the organization. I think that is hogwash. But, these tests do have some useful applications. They give managers a better sense of the varying styles of their employees, information that might be critical in training or coaching staff, crafting a productive work environment and developing a team. For example, if you see a young employee with high leadership potential, you can put them on a fast track to being a future manager. Or, if one employee is a strong leader, pair that person with someone who needs leadership development, to help develop both their skillsets. Just understand the results of a personality test are simply a data point. And one data point should not drive decisions. You need to stay flexible in your hiring practices, understanding that there are going to be different employee types across the organization. Salespeople are typically going to be extroverts, and your web developers are going to be introverts, for example. So, it is nearly impossible to recruit only one type. And, even if you could, why would you? Different perspectives from different people can help the company by viewing business goals through a broader lens. And, for goodness sakes, if you are going to make your current employees take a personality test, make sure the results become accountably acted upon, otherwise you are never going to effectively lead the organization to the goals you have in mind.